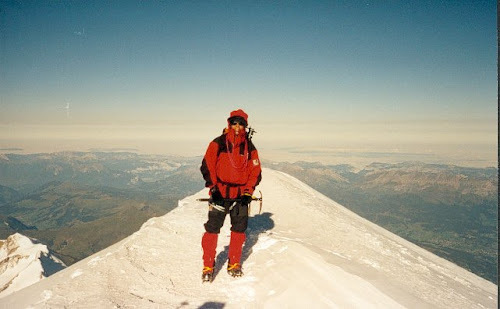 I got the idea of climbing Mont Blanc in 1999, when I read some interesting articles on internet. Making dream become reality happened very fast in this case, as I went to Switzerland the following year to start the acclimatizing in Zermatt. After a couple of 4000 meter climbs, I was pleased to discover that my body adapted very well to high altitude, having no headaches or other problems at all. So I decided to catch a train to Chamonix and start the climb of Mont Blanc immediately. Two weeks before I arrived, however, there was a huge snowfall in the mountains around Chamonix, causing a lot of avalanches and killing more than 10 climbers in one week. Still I decided to stick to my original plan, but I have to admit that all the accidents did not boost my confidence of doing a solo climb right then. 3) dangerous crevasses, especially if one gets off the normal route because off snow storms and low visibility. The mountain has claimed approx 5000 lives so far. Peoples who are underestimating the climb, such as light clothed tourists etc, often end up in fatal accidents in stormy weather. I decided to climb this mountain solo, but this is not recommended because of security issues on the glacier and the narrow ridge. To hire a guide is probably a better choice (700 Euros). I started an early morning by taking the train from Chamonix to St Gervais/Le Fayet and then a tramway up to Nid d'Aigle (2372m). From there it was easy walking up to Tete Rousse Hut (3167m). By then the weather had turned really bad, and I considered staying a night in the hut. However this would make the next day climb to the summit very long, so I decided to continue to Gouter Hut (3817m) in bad weather. First I had to cross the dangerous coloir. I clipped my harness into the fixed rope, and waited 5 minutes to study the frequent rock falls. During those 5 minutes, rocks fell several times from above with incredible speed. I didn't like the situation at all. But finally I started the 50 meters traverse into the coloir, running as fast as possible. My timing was perfect and I reached the other side in safety. From there it was funny scrambling on the spur all the way up to Gouter Hut in rainy weather. I was a little bit surprised when I entered the almost empty hut. Normally it's very crowded in high season, but that day there was a lot of space, and the fact that I didn't have any reservation was certainly not going to be an issue. It seemed like the bad weather forecast had scared the people off the mountain. Only 15 people remained in the hut. By the evening winds had reached incredible speed, and I felt the hut was close to being blown off the ridge. Simple tasks like going to the outdoor toilet, was impossible due to the weather so I had to pee in a bottle. During the night the wind speed was increasing even more, and I hardly got any sleep in all the noise. As my hopes of climbing Mont Blanc faded away, my body started to relax and I finally fell asleep. Normal wakeup call at 2 AM was cancelled due to bad weather. But at 4 AM the weather had improved a lot, and it was time to wake up and get some food. One hour later we started the climb in complete darkness, and the wind occasionally forced us down to a horizontal position. My tactic was to be in the front, but not the first one. The broad glacier trail had vanished during the night because of the storm, and I did not want to waste any energy on route finding. Hence I left a guided team in front of me to break the trail and to find the way up the mountain. Going unroped on the glacier didn't scare me very much. The glacier is not too dangerous as long as one stick to the trail. But I also knew that if I lost the trail, deep crevasses lurk under the fragile snow. When the sun rose I was confident to take the lead and continue on my own. I started to freeze because of the slow pace of the other climbers, so I decided to speed up. I reached Dome de Gouter after a couple of hours. From here I could see the Bosses Ridge and the remaining climb to the summit (see big picture). When I arrived the bivouac hut Vallot, I met 3 Americans coming up the Grand Mulets route. While I decided to take a short break here, the Americans continued the climb. After 10 minutes I continued up the Bosses Ridge, and I was glad having those Americans in front of me breaking the trail, as I started to feel powerless in the high altitude. Walking unroped up the steep and narrow Bosses Ridge is not the wisest thing to do, so I moved slowly up the snow ridge to prevent any errors or falls here, as this would cause a fatal slide to death more than 1000 meters below. The final meters I was resting every 20 meters, to regain my breath. I didn't have headaches or any other problems; it was just hard work in this high altitude. I was so pleased when I finally reached the summit. I have never experienced such great views in my entire life. From the roof of Europe I could see France, Italy and Switzerland. The 30 minutes I spent on the summit (20 minutes totally alone) will forever remain as a special moment in my life. Normally one has to share the summit with 50-100 other people at the same time, so I was extremely lucky to have this silent moment on my own. Descending the 2500 meters from the summit to the tramway felt like a never ending journey. I also got lost on the glacier, leading me into an area with huge crevasses in all directions. The only option was to go back and search for the correct way. My GPS turned out to be very useful here. 0 comments for "Mont Blanc"